In 2014, the Foundation’s board of directors set a goal to become accredited in its 10-year visioning statement. The National Standards for U.S. Community Foundations accreditation process is thorough and rigorous, requiring compliance with the law and an extensive list of internal operating policies and procedures that have been scrutinized and deemed best practice by the sector. The program is directed by the Community Foundation National Standards Board (CFNSB) with support from the Council on Foundations. The Accreditation Seal is only achieved by those foundations that comply with 26 distinct standards of excellence. Lloyd began the process of gathering historical documents and creating new, as well as revising, policies and procedures to be in compliance with National Standards at the end of 2017. After board review and approval of countless documents, the application was formally submitted in March of 2018. 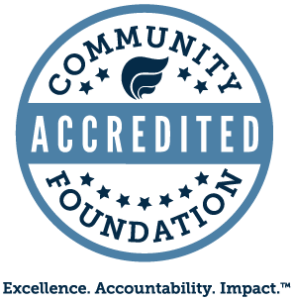 The review process took more than nine months before learning the Knox County Foundation received the National Standards for U.S. Community Foundations seal of accreditation. To receive and maintain accreditation status, community foundations must meet and remain compliant with comprehensive standards around the following key areas of excellence: structure and governance, resource development, accountability, grantmaking, and community engagement. Charitable contributions made to support and strengthen communities are limited and precious. The National Standards seal indicates that these accredited institutions will serve as responsible stewards of these contributions as dedicated community partners and leaders. The Knox County Foundation, celebrating 75 years of operation, is a collection of individual philanthropic funds established by Knox County residents for a wide variety of charitable purposes. Today, the Foundation holds assets in excess of $73 million, has 436 component funds and has used endowment income to award more than $3.2 million in grants county wide, including more than $1 million in scholarships to Knox County nonprofit organizations and college students.